Who are these half-wit Hollywood clowns that keep hiring cleavage-candy actresses with no measurable talent to play laughably bespectacled scientists in action movies? A few years ago it was Denise Richards as history's least credible nuclear physicist in the James Bond flick "The World Is Not Enough." This January's demonic-horror video-game clunker "Alone In the Dark" featured party tart Tara Reid as an archeologist who could barely deliver a coherent sentence without mispronouncing words. Now comes ring-a-dingy Jessica Alba -- hitherto known for playing dancers and strippers -- as smokin' hot Sue Storm, a 23-year-old "director of genetic research" who becomes a radiation-mutated superhero in the bumbling, big-budget but Z-movie-bad adaptation of Marvel comics' "Fantastic Four." Sent into space along with a paper-thin cast of compatriots (a geneticist ex-boyfriend, her failed-astronaut brother, an ex-NASA pilot and a transparently evil billionaire), Sue and this group of supposed geniuses can't even keep track of the glowing cloud of gases they're supposed to be studying. Promptly overrun when the interstellar storm apparently sneaks up behind their space station, each of them returns home with strange new powers. Sue develops the ability to generate force fields and turn invisible (used as an excuse to get Alba naked since her clothes remain opaque), but neither gift helps her convincingly deliver lines like, "You should know those solar winds have been picking up," and "The new read-outs are very promising." Handsomely geeky Reed Richards (angular 30-something Ioan Gruffudd from A&E's "Horatio Hornblower") turns into rubber-bodied team leader Mr. Fantastic, and continues to pine for Sue with all the corniness he can muster while seeking a cure for their "condition." Sue's obnoxiously egotistical sibling Johnny Storm (blandly young'n'hunky Chris Evans from "Cellular") becomes The Human Torch, using his burst-into-fire powers to pick up chicks. 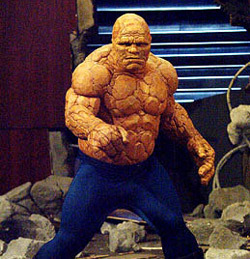 Reed's moody tough-guy pilot pal Ben Grimm (Michael Chiklis from FX's "The Shield") transforms into an indestructible rock-like being called The Thing. And the group's greedy corporate boss Victor Von Doom (plastic-looking Julian McMahon from FX's "Nip/Tuck") finds his body morphing into electricity-conducting metal and decides to destroy the other four so he can take over the world, or something like that. But with a name as ridiculous as Von Doom, what else is he supposed to do? This C-list cast is subject to obsolete CGI effects and characters thinner than the pages of the movie's horrible highlights-reel screenplay, by the same guy who helped over-think "The Hulk" and dumb down "The Punisher." It's often little more than a catalog of obvious contrivances, atrocious exposition, and time-wasting "extreme, dude!" action scenes of snowboarding and motocross racing. The superhero genre has been intelligently revitalized of late thanks to great directors like Sam Raimi (the "Spider-Man" movies) Bryan Singer (the "X-Men" movies) and Christopher Nolan ("Batman Begins"). But comedy director Tim Story ("Taxi," "Barbershop") is out of his depth in "Fantastic Four," which may be the worst comic-book picture since "Batman and Robin" almost buried that franchise eight years ago. That is, unless you stretch the definition to include "Catwoman," which went so far past awful it became wildly entertaining through the sheer power of irony. No such luck here. But if forced to say something nice about this bomb, I'd offer up that there are a few good one-liners ("That's gross," Johnny remarks when Reed first tests out his elasticity) and that Chiklis's rock-body makeup almost looks like it's not made of foam.